I don’t want to draw the parallel too much, but as I wrote for UN Dispatch yesterday, I think there might be a useful historical comparison between the current events in Cote d’Ivoire and the siege of Monrovia, which precipitated the end of the second civil war in Liberia in 2003. Of course, things were quite different in Liberia. Following more than decade of unrest, the country was in shambles, and there was little restraint among warring factions. I’m not on the ground to confirm, but other than the horrifying massacre at Duekoue, I have not heard many reports of widespread, indiscriminate, full-blown violence. 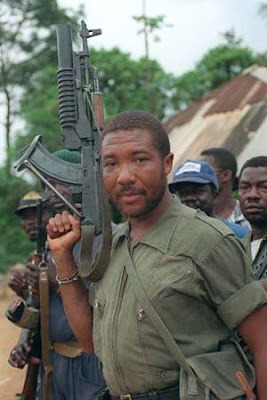 For all the differences between the two conflicts, Laurent Gbagbo’s desperate hold on power is profoundly reminiscent of Charles Taylor’s in Liberia. Like Taylor, Gbagbo has his most loyal men controlling key areas, while he continues to sit in the presidential palace. Monrovia’s unique geography played into the hands of advancing rebel forces, who were able to isolate Taylor in the center of Monrovia by taking over bridges leading into the city. In Abidjan, the layout is different, but, similarly to Monrovia, there are islands and bridges, which are strategically important in urban warfare – whoever gains control of access routes has the advantage. The airport, which is currently controlled by UN and French forces, is on an island. The presidential palace sits on a peninsula. I don’t know how long this siege will last. Gbagbo will not step down, and will not leave easily. The best case scenario is that he’s currently negotiating exile conditions in a third country and will get airlifted with his family. Worst case scenario is that the presidential palace where he sits is stormed by rebels and he is killed. At this stage, I’d say both of these possibilities are equally as realistic. It’s our responsibility to bear witness to what is happening in Cote d’Ivoire now. Unspeakable crimes have already been committed by both sides of the conflict, and will continue to happen. Media and public attention are not silver bullets, but along with the real threat of prosecution, may help attenuate the levels of violence. At least, that is my hope.